Our bedroom is small but it certainly packs a big punch when it comes to comfort and coziness. I was going for somewhat of a ‘lux-glam’ feel in here when we chose everything, but it was very important to me to keep it cozy, comfortable and personal. I love to layer prints and textures, even furniture pieces when I can. 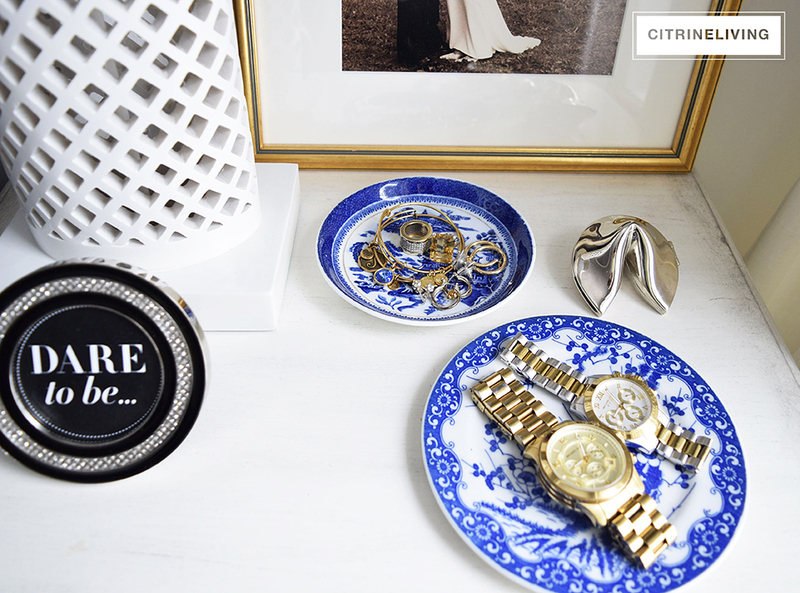 It adds personality when you curate your items, rather than buying things that match perfectly. 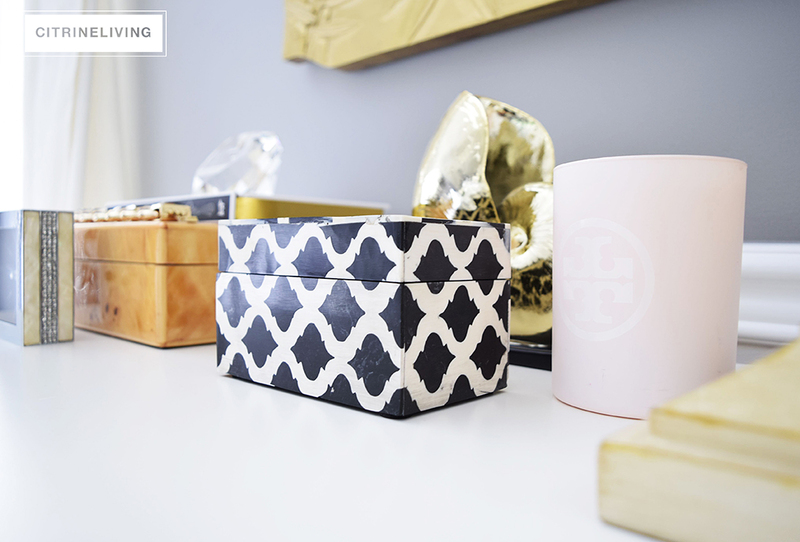 Come and have a look at some of the details I’ve incorporated to create the look of our curated bedroom. Affiliate links are provided throughout, or at the bottom of this post for your shopping convenience – see my full disclosure policy here. 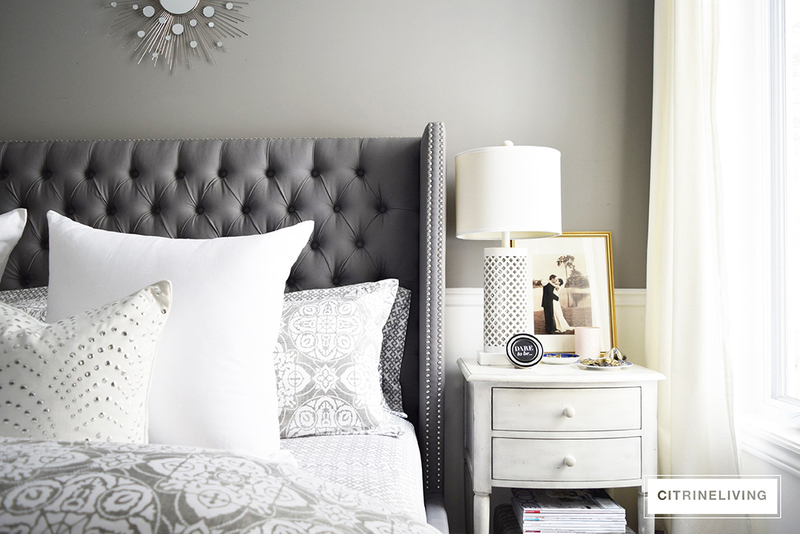 SHOP ALL OF MY DIFFERENT BEDROOM LOOKS HERE! We’ve never been ‘furniture set’ people – by that, I mean we’ve always bought different pieces and pulled them together for a feel that’s more collected. Don’t get me wrong, sets can be gorgeous – however, I personally prefer to use individual pieces that I truly love, to create that curated bedroom look I’m talking about. It’s also much more affordable to buy pieces as you go, rather than thinking you need to buy complete sets at once. I’ve always tried to be resourceful with my decorating, find ways to refinish a piece or shopping for deals or even items with a minor imperfection. It saves a love of money and can help pull together your personal style! That being said, I’ve been searching for some new items in here since we moved our bed to this wall – it’s a king and we need small night tables to fit. I’ve had both of these tables for so many years – one is a garage sale find – a sewing table that I painted and added a pretty knob. The other is from from HomeSense. They’re cute and functional, but I would love to have more storage, and I am actually considering a matching pair, which will still fall under that curated look, since they don’t match the dressers. Our Ikea dresser, which doesn’t seem to be available anymore, is actually a great size and very functional, but it’s little big for this wall – you can see the narrow space I’m left with to walk by – so I’m on the lookout for something new. I’d love a six drawer option, which would be perfect on the wall opposite our bed. 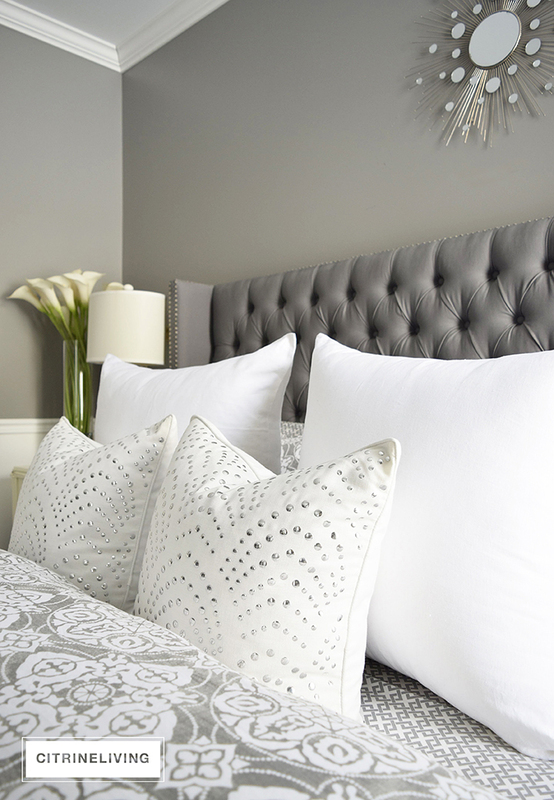 Our upholstered bed is fabulous and we love it. It’s deep and luxurious and the tufting and nailhead trim lend that glamorous fee I was after, but also has a masculine vibe which I really like. We love having the wingback style too, it’s enveloping and cozy. Our bedding is no longer available (I’ve sourced similar bedding for you down below), but I love the rich tile pattern against our streamlined bed. I also love to layer my linens – mixing textures and patterns is a great way to create that curated, collected feel I’m talking about. 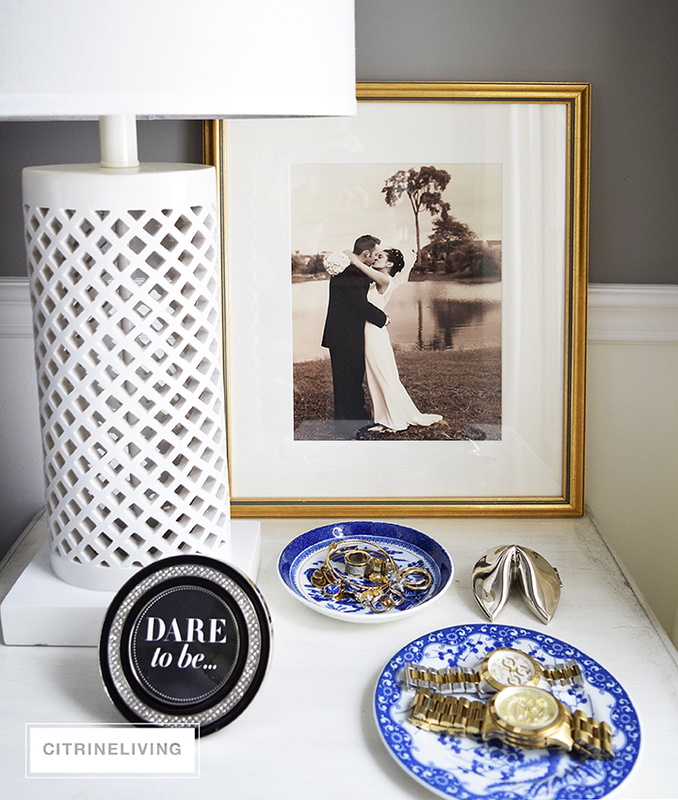 These lattice pattern garden stools are from HomeSense and are another layer that bring more texture into our bedroom. They also pick up on the texture of the lamps as well, which I love. 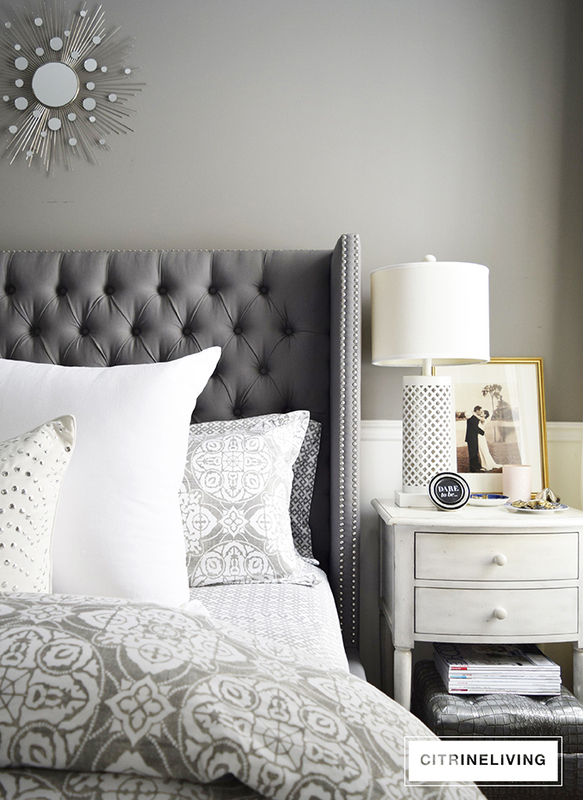 The lattice lamps continue the pattern play and the all white provides the perfect balance to the deep, rich grey tones throughout our bedroom. They play off of the diamond tufting on the headboard, as well as the sheets and throw pillows. I opted for a small scale geometric pattern for the sheets – I love their contrast against the scale of the shams and duvet. I just received my new custom linen euro shams from Superior Custom Linens. You can find the right ones for your style, they have beautiful ruffled options as well. I wanted a sleek modern look to keep the bed from looking too fussy, and the large 28″ size is very dramatic against our large scale headboard. They’re perfect on our bed! 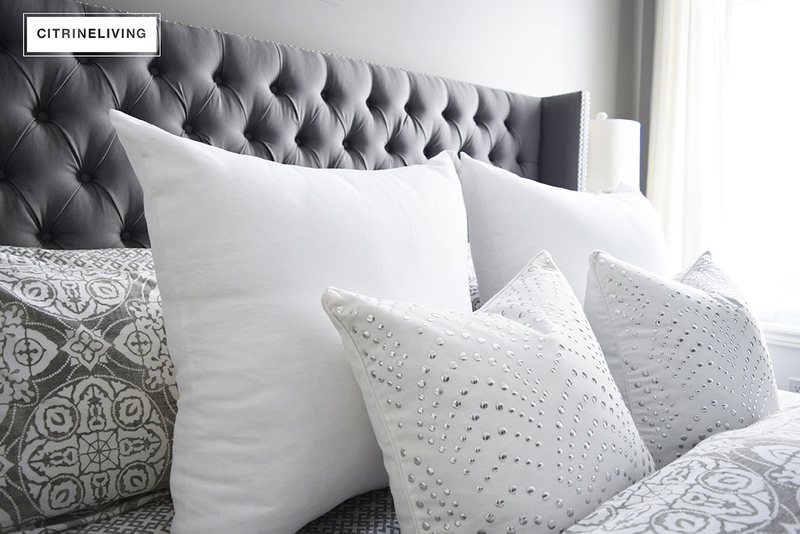 My studded pillows from HomeSense are another study in layering pattern and texture. 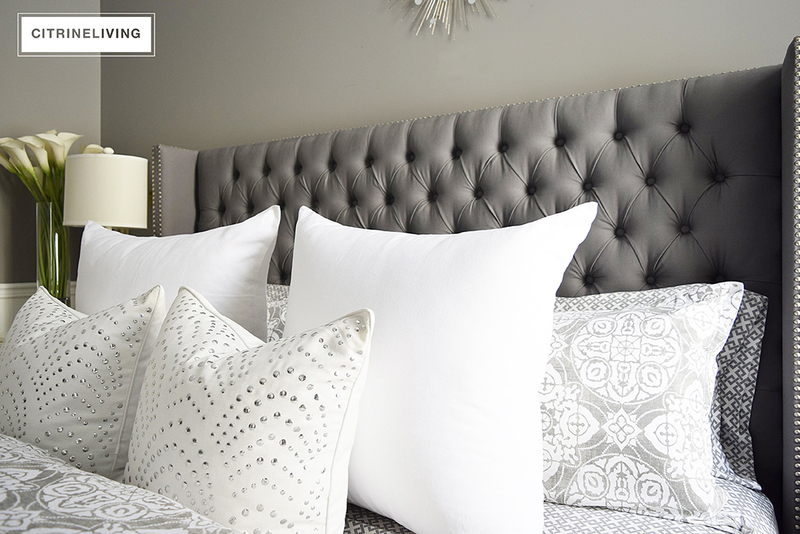 They’re the perfect addition to the bed and they play off the nailhead detail of the headboard beautifully. The angle in the shot below gives you a good sense of what’s happening in our bedroom with all of the layers and pieces of furniture we have in here. 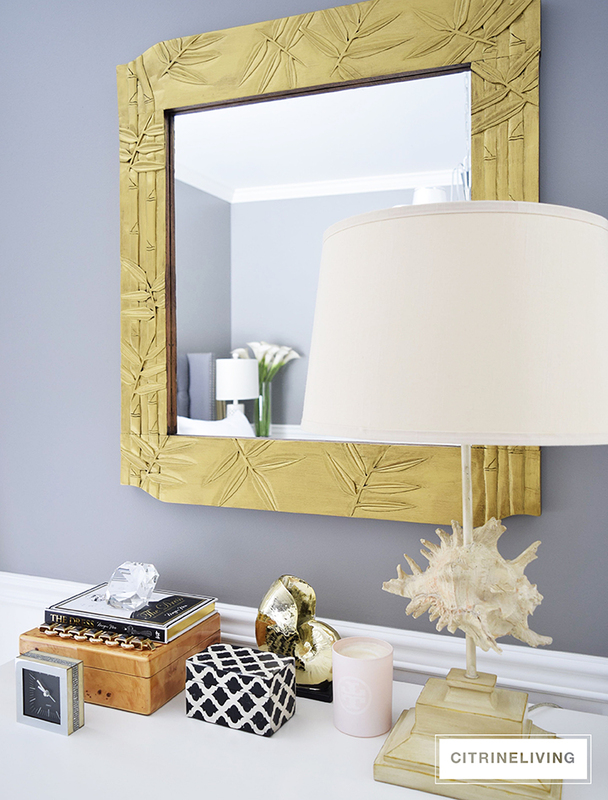 My conch shell lamp on the dresser, mixed in with the hand painted gold mirror and collection of decorative boxes and objects is the perfect little curated and collected mix. Can you see what I mean by a lot furniture in this room? This tufted chair in the corner is a comfy little reading spot. My garden stool is usually outside in the summer, but I like to bring it in here in the winter for a little pop of color. It’s also great for propping my books and heels a little sculptural fashion detail that I love. 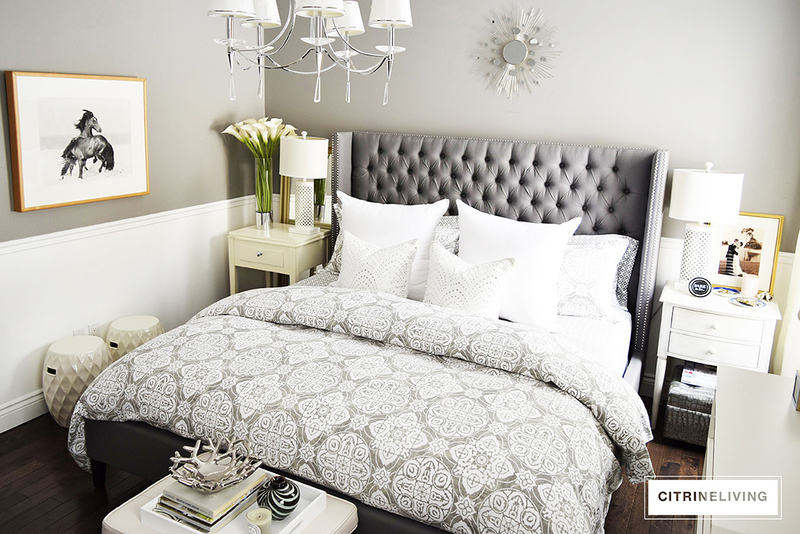 Another tip for creating that curated bedroom look. Using books to decorate is a great way to add a personal, collected feel to any space. I also love to add candles and curiosities to sprinkle around for added character as well. 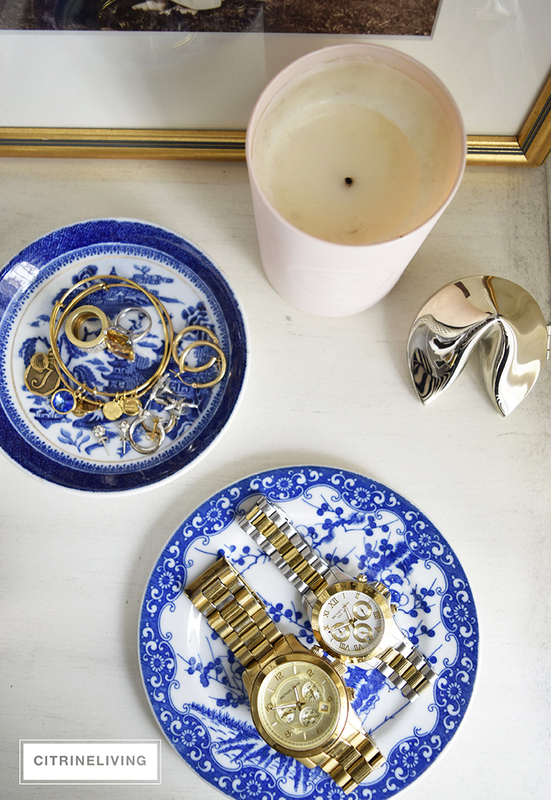 I love to use vintage dishes for my jewelry and the pop of chinoiserie and blue and white is always one of my favorite things. Especially mixed with gold – one of my favorite color combos! It’s the little details that make a big difference when creating a curated bedroom – why not make them as beautiful as possible? I use saucers all over our home for little things like soaps and trinkets. Your room is beautiful and I know you posted a while back but also have a question about your bed. Went on the structure website looking for the gray bed. The one in your room looks like a medium gray but the one listed looks like a darker gray. 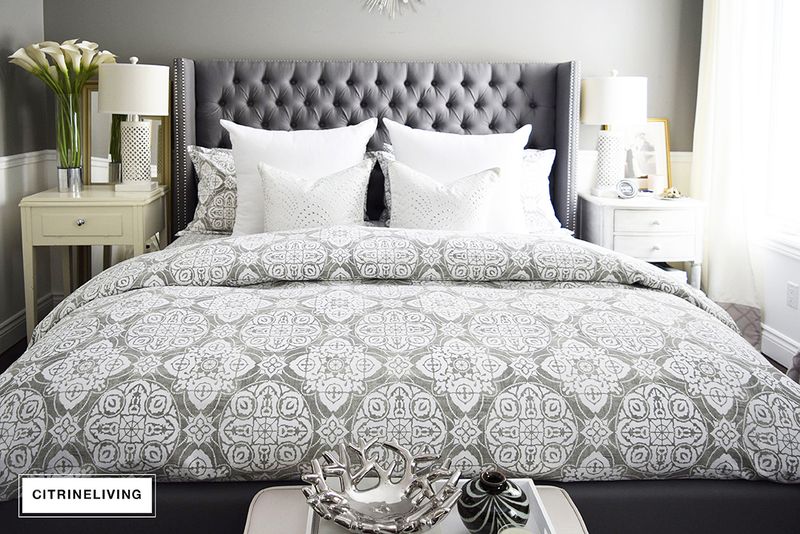 Would you mind clicking on your link to see if you agree that is the gray bed you purchased (color wise). I just love your color so much and want to make sure that is in fact the right one(of course returns for huge purchases are impossible)!